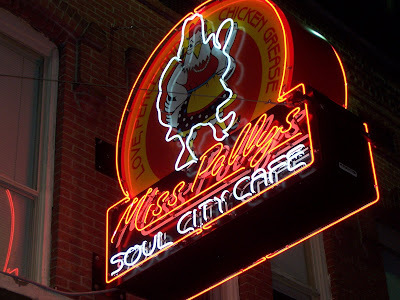 Fat sizzles in the fry pan and the Blues sizzle on Beale Street in Memphis. I have to admit, I’m a neophyte when it comes to Southern cooking, although I’ve managed to do an admirable job of self-education when it comes to baking with Jack Daniels. I’ve got twenty-four hours in Memphis with just enough free time to check out the local cuisine. 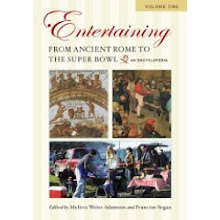 My guide on this culinary odyssey is Dan McCleary, a Shakespearean actor whose work I’ve closely followed for more than a decade. Dan has played the Bard’s greatest roles - Coriolanus, Richard III, Mark Antony, Falstaff and MacBeth. A native of Memphis, he’s back on his home turf for what may well be his greatest role – establishing a permanent Shakespeare company in the state, The Tennessee Shakespeare Company. We walk past horse drawn carriages and hang a right onto historic Beale Street where the preponderance of neon signs dazzles the eyes. The Blues were born on Beale Street in the honky-tonks at the dawn of the 20th century. Although it is a weekday evening, the street is teaming with activity and there is a perceptible haze, which may, or may not be my jet lag. It is the annual Barbeque Fest and down on the Mississippi, pigs are roasting on slow burning fires and hordes of folks are on round-the-clock grill duty. Inside, we are in a long narrow room and are hit by a blast of humid air and the aroma of a seasoned hot skillet. The walls are decorated with photos of the great Blues artists. We take a seat at the Ray Charles table. 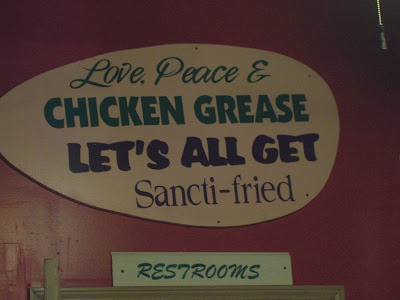 On the back wall is Miss Polly’s slogan: “Love, Peace and Chicken Grease.” That kind of says it all. We’re not here for health food – but we will definitely feel the love. Our server is Jules, a petite woman with sleek, long auburn hair and a porcelain complexion. We order a couple of cold Pabst Blue Ribbons, which Dan devotedly describes as “nectar of the Red Neck.” Jules brings large plastic cups, but we’re classy guys and we drink from the cans. The menu is a thing of beauty – fried food as far as the eye can see. The first course arrives, and it is a Southern classic – fried green tomatoes. Translucent, emerald-colored slices of tomato are coated in a delicate cornmeal batter with a peppery bite. “It’s poor people food,” says Dan. “You didn’t wait for the tomatoes to get ripe, because you had to eat. Frying in cornmeal made it taste better.” Indeed, the tender crunch of the seasoned cornmeal is at first rough and hot on the tongue and then dissolves into sweet, pulpy tomato. Sweet and spicy is the preferred taste combo in the South, according to Dan. My entrée arrives, and it confirms his culinary hypothesis. I’ve ordered the “Hen House,” a platter that includes a humongous hunk of crispy, batter-fried chicken breast, a waffle the size of a Frisbee topped with butter and maple syrup and a side of Hoppin’ John, an old slave dish of black-eyed peas, slab bacon and hot red pepper. Do I feel like a fox or what? Believe it or not, I’ve been conservative in my menu selection. I could have ordered the sixteen-piece fried chicken platter. Dan has ordered Southern Fried Catfish. According to “A Love Affair with Southern Cooking,” by Jean Anderson (HarperCollins, 2007), 94 percent of all U.S. Farm-Raised Catfish comes from the South, and the fish is versatile enough to be baked, broiled, fried, grilled or steamed. Of course, Miss Polly ain’t going for no sissy steaming techniques. Her catfish is fried and she’s proud of it. It’s probably the Pabst Blue Ribbon, but I swear those lightly breaded, glistening white fish are so fresh they’re still wriggling with Southern hospitality. We dive in, head first. On the table, there are fancy napkins if we need them – a fresh, economy-sized roll of Bounty paper towels. You will surely think I’m fibbin' but the food is light as a feather, not heavy like you might expect. In the Northeast, we’d say “the chicken’s got a certain Wessonality” but I wouldn’t dare make such a pedestrian comment on Beale Street. When I am sure I can’t eat any more, Dan suggests dessert. There is another sign of what’s to come on the opposite wall. It reads, “Get Yourself a Skillet Fried Pie.” We order one serving of the peach pie. Our server Jules approves of the choice. “It’s zero calories and zero fat. How cool is that?” she giggles. The golden crescent-moon pie arrives at the table nestled in a cast-iron skillet and sizzling in what looks like a stick of butter and some additional lard thrown in for good measure. It is topped with a dollop of vanilla ice cream that is having a meltdown. The white-hot heat off the skillet is giving me a sunburn. The pie is like sweet, molten lava. It is ridiculously good, but I fear that I will be spending the next six months on my exercise bike. As we are about to stumble from our table, I ask Jules a question that’s been nagging at me. After an overdose of Skillet Fried Pie, I’d believe anything, too. However, it is a mystery to be solved on another visit, and we stagger (or is it swagger?) out onto Beale Street where a Bluesy rhythm rings in our ears and the scent of slow roasted pork fills the balmy Southern night. Sounds like you had the perfect guide to the perfect restaurant for the perfect meal -- and a zero-calorie dessert (that did make me laugh!) -- what better introduction to Memphis than that? Some day, someone has to explain the chicken and waffles thing to me, though. Side note: Memphis CLAIMS to be the birthplace of the blues, but that is debatable. The Mississippi delta area probably has a stronger claim. The city of Cleveland has a small stake in that debate. (But, c'mon, it's Cleveland.) Areas of Texas and the city of Chicago all can claim to have "rounded out" the creation of the blues. All said, Memphis most exudes the blues, particularly when enjoyed with fried pie. I have six green tomatoes on my counter and your photo makes it clear to me what I should have for lunch (or maybe even breakfast). What did they serve on the side to dip the tomatoes in? I'm guessing ranch dressing. 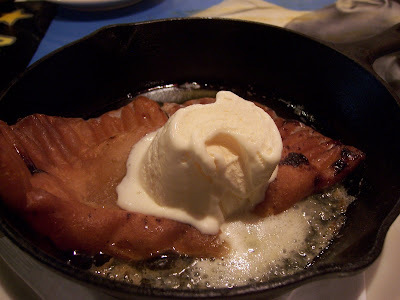 Great photo of the fried pie--one can almost feel how fattening it is. I don't understand the chicken and waffles thing either. It's probably a good thing you were only there for 24 hours. What a deliciously sounding post T.W. 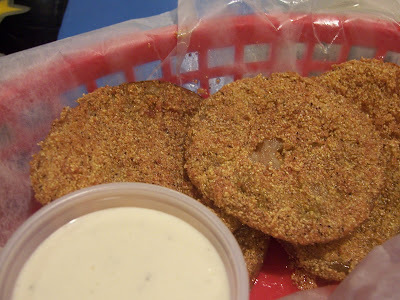 I've had such a hankering for fried green tomatoes, they look scrumptious! bwa...ha..ha...evil place but I'm drooling right now because I love fried food! I would like to know how to make a zero calorie, zero grams of fat dessert! 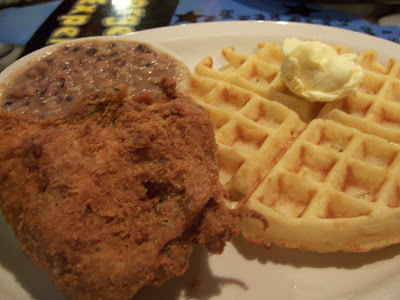 *A waffle with pulled, stewed chicken and covered with gravy is common in Pennsylvania Dutch Country. Some historians cite the dish as an African American tradition. *Thomas Jefferson brought a waffle iron back from France in the 1790s and the combination of Chicken and Waffles began appearing in cookbooks shortly thereafter. *The Wells Supper Club in Harlem which was in operation from 1938 to 1999 used the slogan: “Wells: Home of Chicken and Waffles since 1938.” The story goes that Wells started selling the dish to late-night patrons, as it was too late for dinner and too early for breakfast, so they put both items on the same plate. *Some historians believe the dish comes out of the rural tradition of serving a breakfast bread with whatever meat you had available. Chickens were sometimes slaughtered and fried for breakfast. This might not increase your appetite for Chicken and Waffles, but I sure found it interesting! Splint - I'd completely forgotten about your voracious appetite for the Blues. You would have loved this place, especially the fried pie. And I hope your comments don't inspire a flood of responses from Cleveland! Kathy - I believe it was a ranch dressing, although it wasn't as tart as what we have in the Northeast. Louise, I'd never tried Fried Green Tomatoes before, but now I'm hooked. Veron - you would have been in heaven. I think I gained weight just walking in the door. Once in a while it is great to have a meal like this! Sounds like you had a good guide and a great time! Having lived in NC for several years, I'm more than a neophyte but definitely still an amateur. I must admit, my first authentic Southern dish was fried green tomatoes in Atlanta (and I still have a soft spot for them). Next has to be biscuits then grits. I'm so glad you had a real Southern experience, TW. Hi Susan - I did love those fried green tomatoes, but buscuits and grits is right up there on my list for the next visit!